All stats are updated through the games of January 20. For up-to-the-minute coverage of this week’s college basketball action, visit us on Twitter and follow @PalestraBack. No SEC team, other than Kentucky, has been ranked in the top ten of the final AP Poll since Florida was the top ranked team in the country back in 2014. Since 2011, only three SEC schools have reached the Elite Eight. Given the conference’s recent basketball history, it can be tough to take the top teams in the SEC seriously when they rise to the top of the polls. If they aren’t Kentucky, or haven’t beaten Kentucky, any SEC team claiming to have Final Four aspirations has drawn a fair amount of skepticism from the general public. That should not be the case for this year’s Tennessee Volunteers. 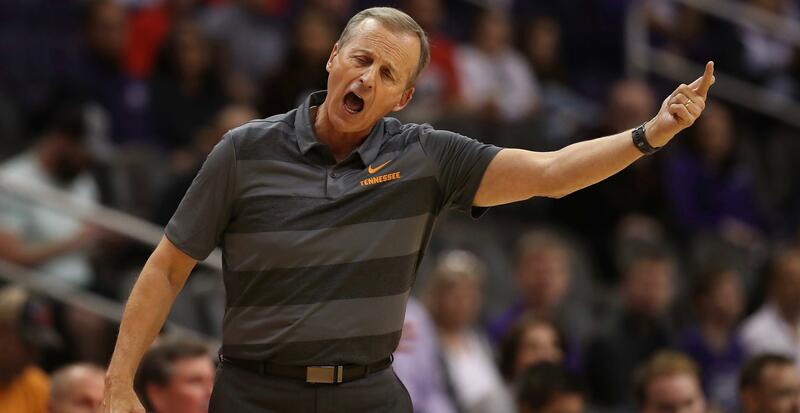 Rick Barnes, whose tenure at Texas feels like lifetimes ago, has a real, bona fide Final Four level team on his hands in Knoxville. After beating Alabama Saturday the Vols have won 11 straight and sit at 16-1 on the season. Their only loss of the year came against Kansas, in overtime, on a neutral court. Lest you think Tennessee has simply been squashing cupcakes, the Vols have faced the 39th toughest schedule in the nation, per KenPom. Few, if any, teams in college basketball can match resumes with Tennessee. Barnes has the Vols rolling thanks to one of the country’s most efficient offenses, scoring 1.22 points per possession (per KenPom). Tennessee simply doesn’t waste trips down the floor, maximizing every opportunity. No team in college basketball has a lower percentage of their field goal attempts blocked, in large part because the Vols work to find high-quality, uncontested looks at the rim. They do this by sharing the ball exceptionally well, to the tune of the 5th best assist rate in the nation. Tennessee has assisted on 340 of its 523 field goals this season. The Vols have lost the turnover battle in just one of their games this season, a back and forth thrilling win versus Memphis. Barnes has his team understanding that the best shot is an open one, with the entire lineup willing to pass up their own shots for the right shot on any given possession. Defensively, the Vols have been solid across the board, leading the SEC in key categories like 2-point shooting percentage allowed and adjusted defensive efficiency. Barnes has athletes throughout his rotation that are capable of guarding multiple positions, handling a switch, and closing out on shooters. The result is a cohesive defense that rotates and reacts to any offensive scheme. Everything Tennessee does, on both ends of the court, is driven by defending SEC Player of the Year Grant Williams. The 6-foot-7 junior forward is the best player in the conference again this season and has played like a First Team All-American. Williams is built like a freight train, but is light on his feet and impossible to keep out of the paint. Once he enters the key, he’s proven very difficult to stop. This season, Williams is shooting 74 percent at the rim. He rounds out his game by hitting 39 percent from outside the arc and 82 percent at the free throw line. Give him an extra step to prevent him from attacking the rim and Williams can knock down a jumper. Reach in or get physical to slow him down and Williams will earn a foul call and make you pay at the foul line. He’s drawing 7.4 fouls per 40 minutes this season, sixth best among major conference players. Perhaps the best thing about Williams and his arsenal of ways to score is his patience and strong decision making. He isn’t selfish, tossing 3.6 assists per game, and has just 35 turnovers on the season. When he catches the ball, he isn’t in a hurry. Williams reads the defense and finds the best scoring chance for the Vols. Here he sees Gonzaga pack the paint and give him some room, so he squares up and drains a jump shot. Williams’ success extends beyond what he can do with the ball in his hands. The Charlotte native nabs 7.5 rebounds per game and has four double-doubles this season. Williams leads a team-wide effort to clean the defensive glass, leading to an efficient secondary break on the offensive end. Perhaps Williams’ most valuable skill though, is his defense. He is able to use his quick feet and wide body to keep perimeter scorers pinned outside the arc, but he also has the meat, strength, and smarts to battle with nearly any size big man on the post. Hachimura is taller, quicker, and springier than Williams. He faces up with room to operate. Williams responds by driving Hachimura into trouble and pokes the ball away for a turnover. It’s textbook defense by a player who, while leading his team offensively, still loves to put the clamps on the other team’s best player. Williams is far from alone. One good player isn’t enough to drive a team to title contention. Admiral Schofield has been excellent, scoring more than 17 points per game, bullying opposing forwards on the block, and shooting 46 percent from beyond the arc. Jordan Bone (cue the Captain Holt clip) has been one of the best point guards in the SEC, tossing more than 6 assists per game this season. In total, the Vols have a balanced attack, built around a go-to-guy, and an active, energetic defense. If you’re thinking about writing off Tennessee because of the school’s basketball history or the conference in which it plays, think again. The Volunteers are as good as any team in college basketball and need to be respected as such. Thankfully, the voters in the AP Poll agree. Tennessee begins this week at the very top of the poll, ranked No. 1 for the first time in more than a decade. With the talent on this Volunteer roster, they have earned that designation and have a real chance to bring a championship to Knoxville. They’re doing great, but their close win to Alabama the other night was somewhat concerning. Alabama is playing better! In conference play, a win is a win.